We spent an hour with Sebastian Michalski at the Canarsie skatepark in Brooklyn, NY. We held a vote on our Instagram account asking if there should be a session before our anniversary party. The votes came in and the majority said yes! 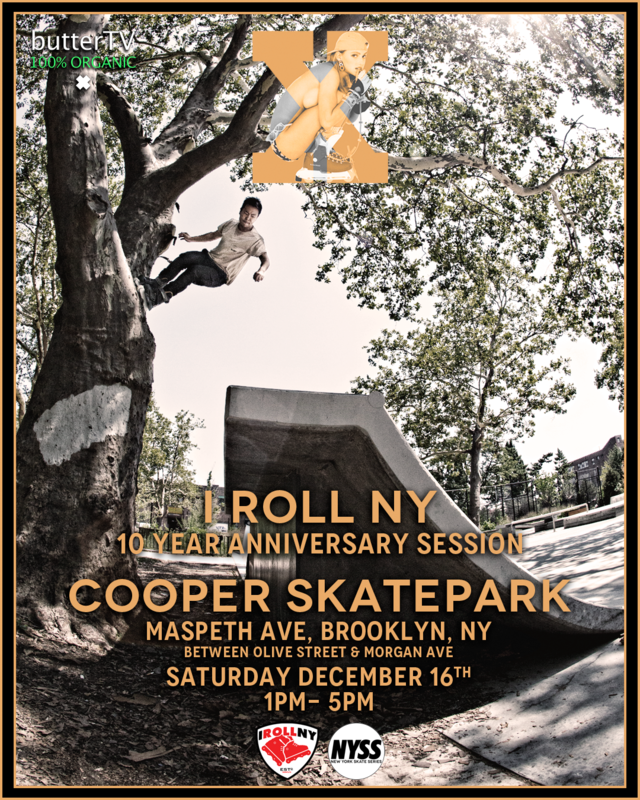 We’ll be hosting our 10 year anniversary session at Cooper Park skatepark, which is only a short walk from R Bar where we’ll be hosting video premieres and having celebratory drinks in honor of a decade of I Roll NY. Get all the info on the anniversary session below. Photo credit Butter TV. Date: Saturday December 16th, 2017. I Roll NY started as a small blog in 2007 and grew to become a staple not only in the New York rollerblading scene, but the rollerblading world in general. 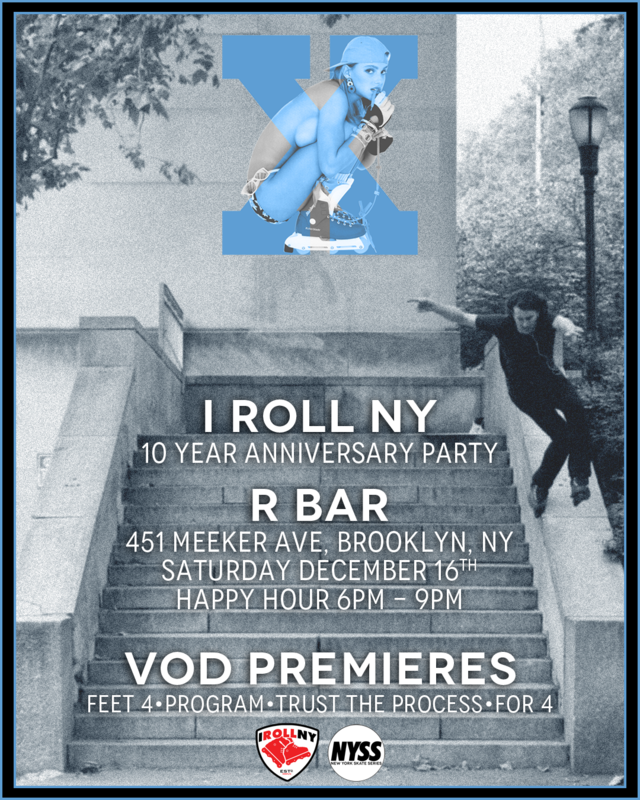 We’re celebrating the decade long run of I Roll NY by throwing a huge party Saturday December 16th at R Bar in Brooklyn, NY. We’ll be premiering multiple VOD’s like, Feet 4, Program, Trust The PRocess, F.O.R. 4 and more! There will also be drink and food specials all night long. Get all the info and details below. Make sure to RSVP via the Facebook event page to keep up to date with the festivities. Stefan Brandow came down to NYC and we were lucky enough to join in on some of his sessions while he was filming for both his Razors profile and Brigade edit with Sean Grossman. Check the Be-Mag article to see our photos along with Ryan Loewy’s during Stefan’s stay in NYC. Be-Mag article here. Easter weekend Zack Savage let us know he was in town visiting NYC for a few days. We met up with Zack at the Hamilton Bridge Skatepark, where we had the park mostly to ourselves. Filmed / Edited by: Craig Benabu. It’s been a while since we’ve been on YouTube, but I Roll NY returns with a brief edit to wipe the dust off our channel. 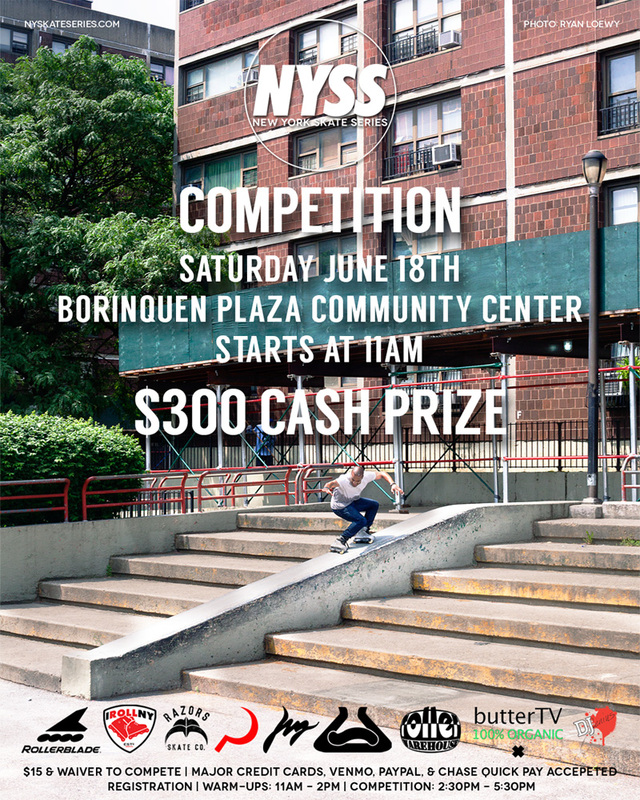 Saturday, February 17th, we met up with Pablo Munoz, Jesus Medina, Jose Henriquez, Kyle Johnson and a handful of other bladers in Harlem World to enjoy the holiday weekend. 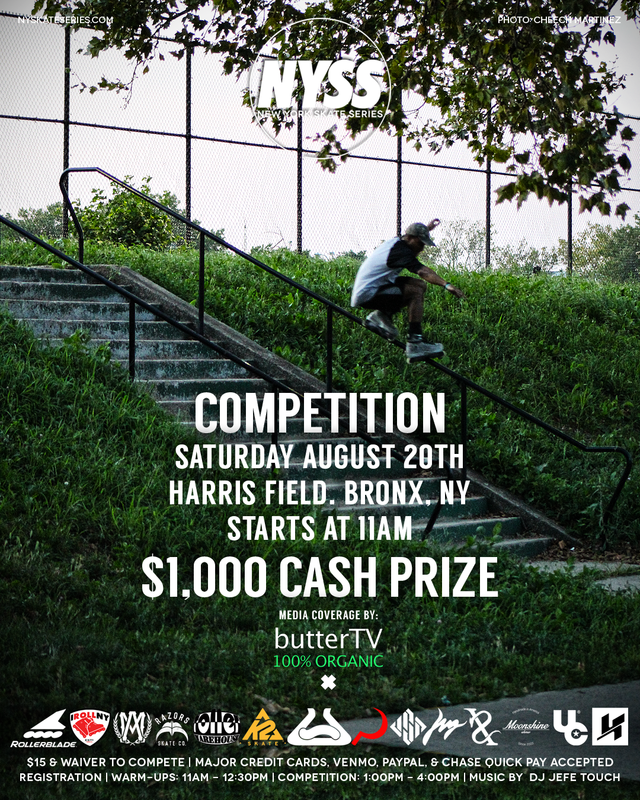 The grand finale of the New York Skate Series Summer 16 competitions is taking place this Saturday in the Bronx! 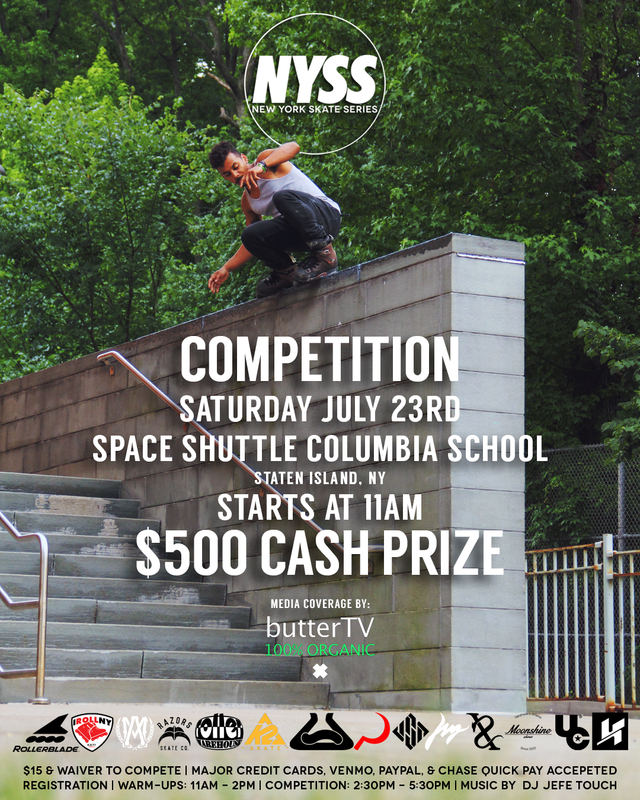 This competition will be different than all the past NYSS events as it’s an open format competition. That means no one gets eliminated during the competition and the top 3 will be chosen from all the competitors. Best trick prizes will be given out after each round and an overall best trick winner will receive a free skate voucher from Rollerblade. Check out the Facebook Event page for more info. Competitors can pre-sign the waiver here and pre-pay the enrance fee here. Date: Saturday August 20, 2016.